New Zealand’s first Rail Trail and Original Great Ride is in the stunning, picturesque landscape of Central Otago, near Queenstown. Opened in 2000 the 152km long trail follows the former route of the Otago Central Railway. Because the trail has been created on what used to be rail tracks the gradient is ideal for cyclists of all ages and fitness levels. And for those who may have a medical condition or are less fit there is now the option to join in with the rest by riding an ‘e-bike’ which takes the hard work out of biking and it makes it more manageable for people of lesser ability. Ranked #1 of “Things to Do” in Central Otago by Trip Advisor the Otago Central Rail Trail has been described as “A must ride in a beautiful part of the world” and an “awesome trail, challenging and rewarding“. The trail is approximately 150 kilometres and usually done over three to five days although some extra-keen cyclists have been known to do it in one day. Connecting four Central Otago plains and valleys, the Rail Trail includes the Strath Taieri and the township of Middlemarch, the Maniototo (with Ranfurly at its centre), Ida Valley and Oturehua, and the Manuherikia area – with Alexandra and Clyde. You will experience magnificent viaducts and the intricate stonework in bridges and tunnels. These demonstrate not only the extraordinary skills of engineers and stonemasons but the tenacity of the many labourers who often worked in conditions of great hardship, especially in winter. Dotted along the trail you will also find other townships with a full range of accommodations available – suitable for large groups, families, couples, back-packers and “luxury-seekers”. The Central Otago Rail Trail offers many compelling reasons to ride. As you travel through this untamed natural environment with its intriguing history there is plenty to explore on and off the trail. Discover old historic gold-mining villages, country pubs, rugged breath-taking scenery with views of distant mountains, and enjoy the good “old-fashioned Southern hospitality” along the way. Cycle Surgery is a highly profitable business that has been operating on the Central Otago Rail Trail since its inception in 2000. The company mission statement “Is to provide the ultimate cycling experience in New Zealand“. Cycle Surgery may be best described as “The Rail Trail Travel Agent” because it facilitates the entire Rail Trail Experience from Start to Finish, including bike hire, accommodation, pick-ups and drop-offs and general advice. It is effectively a “one-stop-shop”. Having operated the business for almost 20 years the owners Dave and Pip have decided that it is now time to do something different and have put it on the market with Tourism Properties.Com. Priced at just USD $540,000 (approx) this includes 2018 bikes, a proprietary on-line booking system, exclusive use of the Cycle Surgery brand and forward bookings that already account for over USD $215,000 gross margin. So a big part of the purchase price is already well and truly covered! And the great thing about this business is that it closes over the Winter months – allowing the owners time off to do other things – but the bookings and cash-flow still keep coming in! This is an ideal business for a couple seeking a change in lifestyle in one of the most beautiful, safe places in the World. For further information please complete the inquiry form below. Tourism in New Zealand is “red hot” at the moment. The tourism industry has overtaken dairy as New Zealand’s top export earner, with nothing to suggest an imminent slowdown in the tourist boom. In the the year ended December 2016 there were close to 3.5 million visitors. Australia made up about 40% of tourist arrivals on an annual basis, followed by China at 12%, the United Kingdom 8%, and the United States 8%. This boom is continuing to drive unprecedented growth in hotel occupancy and room rates, new research from Colliers International shows. The rapid growth is putting the tourism industry ahead of schedule to achieve our Tourism 2025 goal of $41 billion total tourism revenue per year. Appetite from overseas travellers is increasing at an increasing rate. According to a recent New Zealand Tourism Forecasts 2016-2022 (MBIE 2016) the annual growth rate for Chinese visitors in particular is expected to outstrip all other markets. China will be New Zealand’s largest market for spend in 2017, as well as the fast-growing. In terms of absolute volume, Australia is forecast to remain New Zealand’s largest market for arrivals over the forecast period, but growth in visitors from China outstrips all other markets. Visitor growth from emerging markets India and Indonesia will be significant, albeit from a much smaller base of visitors. According to a recent article by Rodney Dickens, the managing director and chief research officer of Strategic Risk Analysis Limited, factors behind this boom (despite a generally high NZD in recent years) include growing per capita incomes in parts of Asia resulting in increased propensity to travel and associated with this has been many new routes being opened up between NZ and Asia and falling airfares that recently will have been driven at least partly by lower fuel costs. I would further suggest that other factors include increasing volatility such as Brexit, Trump’s election and global terrorist activity have enhanced N.Z’s reputation as a relatively safe place to visit. Dickens also says that this growth has driven occupancy rates to the highest level on record and this is somewhat belatedly flowing through to increased consents for hotels etc. If you are interested in a hospitality and/or accommodation-based business in New Zealand, here are some South-Island businesses for consideration. Apartments at St Clair (Dunedin) – The Majestic Mansions – approx NZ$2,390,000 for Freehold land, buildings and business – beachside! This thriving business has a serious cash-flow with resulting bottom line profits and significant development potential. Established icon in the local (Dunedin) hospitality industry – catering to a wide range of loyal clientele including professional people, tourists, students and families. It is generally the first ‘after-match’ stop for visiting sports teams and their supporters, and is the ‘Official Club Rooms of The Highlanders’. Now enjoying a significant turnover of approx $4m and employing approx 46 staff, there are some great opportunities providing a strong platform for continued growth. This is a stable cash-flow business comprising 18-units. It has outstanding occupancy with impressive returns! Being close to the popular St Kilda Beach, away from the concentrated ‘motel strip’ of George Street, and priced at an afforable level, these Motels have a loyal following that is relatively immune to economic cycles. This is a well-priced, hospitality-based business in a relaxed location that offers great lifestyle and access to some of New Zealand’s most stunning scenery and outdoor activities. This is a heritage listed mansion located in the heart of Dunedin offering a lifestyle and business opportunity with a diversified mix of short (B & B) and longer-term visitor accommodation. Please contact me for further information on these and other opportunities. If you a seeking a quality investment property, with reliable cash-flow in a top location, then this is it! 'Rooftops' – 487 George Street, DUNEDIN. Offers invited. » New Zealand Property Based Investments. 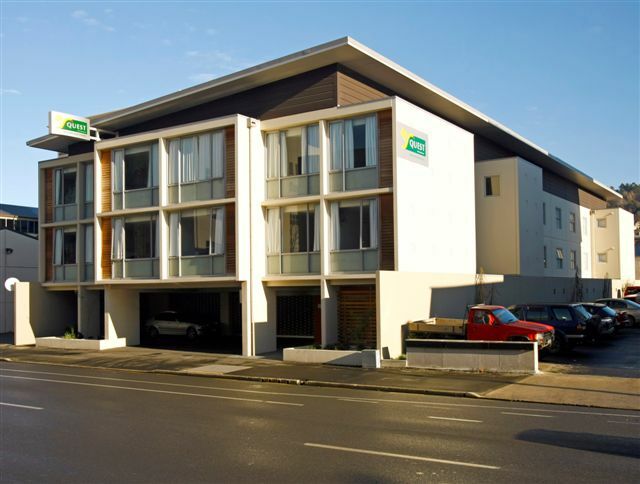 This modern commercial property is in a prime location in Dunedin, New Zealand. Featuring serviced apartments, all on individual freehold unit titles, with strong lease to Quest, this represents an outstanding, relatively passive commercial investment with reliable cashflow. For further information refer to the link below. NZ Property Based Investments » New Zealand Property Based Investments. New Zealand now the “Most Socially Advanced” Country in the World! New Zealand has come through the recent GFC strongly and is poised for steady growth on the back of a relatively strong economy based primarily on agriculture (you can’t go wrong feeding the world!) and tourism. It is also a wonderful placed to invest, especially being recently ranked one of the world’s least corrupt countries and one of the easiest to do business in. And it has now been rated the World’s Most Socially Advanced Country as discussed in the following articles.